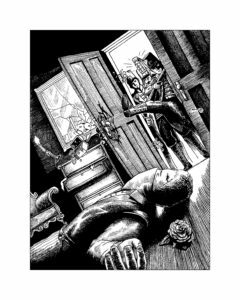 A gamebook is more than a simple branching narrative: it is an explorable world that resembles a solo Role-Playing Game, with quests, encounters, non-player-characters and many of the other features of modern fantasy RPGs. For example, you will need to track your character statistics (RUTHLESSNESS, ENGINEERING, MOTORING, INGENUITY, NIMBLENESS and GALLANTRY) and to make skill checks at crucial points in the adventure. You will also track where you have been and what you have experienced through a combination of tickboxes and codewords that you collect. This means that you can return to locations or meet characters for a second time and discover new content – perhaps dependent upon your earlier choices. A gamebook works by presenting you with short pieces of narrative, interspersed with choices. Each choice will direct you to another numbered passage, where you can read the consequence of your choice. Yes. While a computer-based RPG does all the jobs of skill-checks, level-ups and path-tracking for you, making your experience arguably more immersive, a paper gamebook retains something special: the feel of story-telling. Instead of reloading repeated saves to get the best outcome, a reader is limited by the number and arrangement of fingers they can stick in the pages. The discipline of keeping a pencilled list of skills and possessions means that every object gained or lost has a little more value to the reader. The tantalising prospect of coming across fascinating shards of narrative in the next or previous passage to the one you are meant to be reading prompts the reader to wonder how their choices can ever take them there. 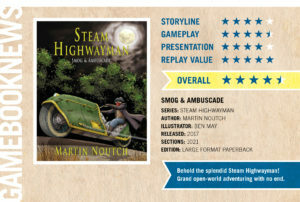 Why not download a short ‘demo’ version of Steam Highwayman 1 here: DemoSH1.1 You will need a pair of dice, a pencil, a copy of this Map and an Adventure Sheet.